Algeria, officially the People's Democratic Republic of Algeria, is a country located in North Africa. It is the largest country on the Mediterranean sea, the second largest on the African continent. It is bordered by Tunisia in the northeast, Libya in the east, Niger in the southeast, Mali and Mauritania in the southwest, Morocco in the west and northwest, and the Mediterranean Sea in the north. The capital of Algeria is Algiers. Algeria is a member of the United Nations, African Union, OPEC and the Arab League. It also contributed towards the creation of the Arab Maghreb Union. Technical specifications of the most frequently encountered Algerian gold coins. 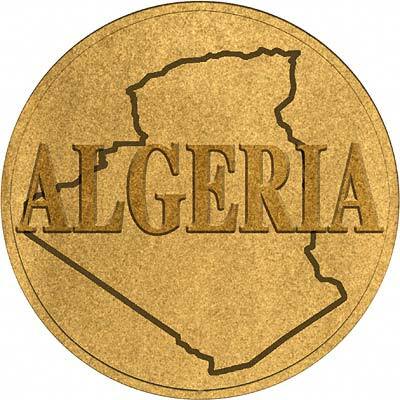 For silver and base metal coins of Algeria, please look at our original Chard Coins website. We make an active market in almost all world coins, gold or otherwise, including Algerian gold coins. If you have any of these coins to sell, please contact us, or post them to us for appraisal and offer.